Suicide crosses all human boundaries and alters the lives of everyone involved. While the help of a friend may be a phone call away, people in deep isolation have difficulty reaching out, often because they feel guilty and ashamed of their situation. TOWARD DAYLIGHT kindles the hope necessary for the living to face, and move on from, the pain and loss of suicide. 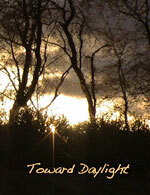 TOWARD DAYLIGHT combines the stories of five individuals struggling to cope with a variety of suicidal incidences. Some are finding hope after being abandoned in the most tragic way, while others have lived through their own attempt and are rebuilding a healthier life. Their stories are unique, but each person faces the difficulty of achieving a full recovery because of the anger, guilt, and stigma surrounding suicide.